(Cherry Hill, N.J.) – Cherry Hill Mayor Chuck Cahn was sworn in for a second term as Mayor of Cherry Hill on Monday, Jan 4., before a standing-room-only crowd of more than 150 people at the Township's Municipal Building. 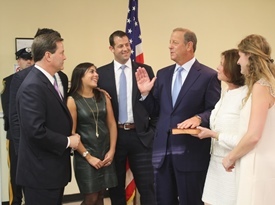 United States Congressman Donald Norcross administered the Oath of Office to Mayor Cahn. Former Mayor Susan Bass Levin swore in council members Sara Lipsett, Melinda Kane and Brian Bauerle to new terms in office. Each will serve a four-year term in their respective position. Mayor Cahn pledged to continue working full-time to run Cherry Hill efficiently and effectively, and cited Public Safety and investment in roads and other critical infrastructure as his top priorities for his second term. “Good afternoon, everyone. I want to thank all of you for being here today, and I want to wish each and every one of you a Happy and Healthy New Year. This is an exciting day for me, as I prepare to begin my second term as Mayor of Cherry Hill. I was humbled then, and remain so now, by your confidence and faith in me. Thank you. My entire family, for being here today; David, Remy, Matthew & Elizabeth, and, especially, my wife, Stephanie. Thank you for your continued love and support, and for the insight you have given me during my time in office and throughout our 36 years together. My friend Rabbi Lindemann, for delivering today’s invocation. Thank you to Congressman Donald Norcross: For swearing me in and for your service to both our community and our country. The members of Town Council: Thank you for your continued support and partnership, and for your willingness to work together for the good of Cherry Hill throughout the last four years, and as we move into the future. We love this place together! To my good friend and mentor, Susan Bass Levin, affectionately known as SBL, for your guidance and support, and for helping to build my trust in myself as I’ve grown in my role as Mayor. To all my department heads and staff in Town Hall: For your continued dedication and service to the Township and its residents, and for working tirelessly every day to ensure Cherry Hill remains a great place to live, work and play. We have a great team of professionals, who am I so proud to work alongside each and every day. And, of course, to the people of Cherry Hill, for your continued trust and confidence; for your feedback and engagement over the last four years; and for your support as we enter into this next chapter in our Township’s history. You all have shown me what “community” truly means. Over the last four years, I have been honored by the honesty, the insight and the commitment of Cherry Hill’s residents from every neighborhood and every corner of the town. You have given me great strength and determination to be a good mayor. I know we all share a passion to keep Cherry Hill vibrant, healthy and strong. Cherry Hill is truly a great place. We’re fortunate to have a healthy economy with safe neighborhoods and great schools. We have outstanding cultural and recreational resources like our trails, our historic properties at Croft Farm and Barclay Farmstead, and our many recreation opportunities. Our environmental commitment is strong; our business sector is growing; our residential neighborhoods are in high demand. Four years ago, I took the Oath of Office as Mayor of Cherry Hill, with a promise to run the Township efficiently and effectively; to preserve our strong, vibrant neighborhoods; to invest in our community, and in important services such as public safety, roads and recreation; to build stronger relationships with our schools; and to revitalize our underperforming areas of our town. And as we enter this New Year, and the start of my second term of Mayor of this great community, there is much to celebrate. As I stand here before you today, Cherry Hill is certainly not the same town it was when I took office four years ago, and I believe we are leaving a trail. I’d like to take a few minutes to reflect on a few of our major accomplishments. I am proud that we have not raised municipal taxes in four years, while at the same time, we have continued to deliver stronger town services and build our local economy, which will sustain Cherry Hill for many generations to come. And while I am proud that we have kept our promise to run our town efficiently, I am also proud that we have done so with compassion, by listening to you, our residents, and using common sense in our policy- and decision-making. We have saved our residents over $5 million dollars by smart refinancing of debt and are on track to pay off over 97% of our current debt in the next 10 years. This will provide true financial stability for the future generations – something that should be very important to all of us. I am proud that we have been able to spur new economic development and reinvestment – and to witness Cherry Hill’s evolution from a town known for its shopping malls and restaurants into a regional medical hub that will soon be home to some of the biggest names in medicine. I am proud of our work to protect the integrity of our neighborhoods through strong property maintenance regulations and our continued commitment to our neighborhood parks and trails, which has helped to increase property values. As we move into the future, I look forward to seeing our community’s gateways transformed into vibrant, thriving sites that truly reflect Cherry Hill’s character and identity. And I am proud that we have taken the necessary steps to forever protect our most important asset: Our remaining open space - at places like Woodcrest Country Club, Barclay Farmstead and Croft Farm, at Springdale Farm, and in every corner of Cherry Hill. We have set a standard, and been recognized as a model for cities and towns across New Jersey when it comes to protecting our zoning and open space. I am proud of the strong relationship I’ve built in the last four years with the Board of Education and our Superintendent, and with the Cherry Hill Fire Department, our Fire Commissioners, and our Fire Chief. And I am proud that our Library stands today as an Informational and Technical Resource and Community Center for our entire town. I am excited to see that - as a result of our hard work - so many young families are moving into Cherry Hill in record numbers, while our seniors are reinvesting and exploring the services and amenities that make this a great place to retire, as well. In four years, we have tackled an endless number of other initiatives, projects and changes to make this town a better place to live and work. There will always be more work to do, but I remain committed to taking on every challenge with the same energy and drive. And now it is time to move forward. For all of us, the world has changed dramatically over the last four years. As I look forward to this New Year and beyond, Public Safety will remain a foremost priority. Under the leadership of Chief Bud Monaghan, our Cherry Hill Police Department has adopted a new policing model, combined with a true emphasis on community outreach. Chief Monaghan has served at the highest level and as exceeded all of my expectations. And I want to commend the Chief, Captains Lyons, Swierczynski and Winters and the rest of the Department, for their service and dedication to ensuring that our neighborhoods, businesses, schools, places of worship, residents and visitors in every part of this Town remain safe and secure. In the last four years, we have invested heavily in new police technology and equipment that have enabled a more efficient, proactive, and data-driven approach to local policing. This allows our men and women in uniform to stay one step ahead of any potential issue that may arise. At the same time, these changes have allowed a greater focus on daily interaction between our police department and the community its officers have vowed to Serve and Protect. The Cherry Hill Police Department is truly one of the best in the state, and I believe these new tools and initiatives will put our public safety professionals in an even stronger position to safeguard every sector of this community. And there are other significant initiatives on the horizon in 2016 and beyond, including proactively addressing our aging roads, where we have committed over $8 million this year - more than 4 times the amount when I first took office. And while there is still much work to be done, I am so proud of what we have accomplished thus far. Cherry Hill is once again a place where families, seniors and young professionals alike want to live. Cherry Hill is now a place where businesses of all sizes, across all sectors, want to be. We are running Cherry Hill more efficiently, and have positioned ourselves to invest heavily in our community today, while providing the stability and financial security needed to protect for the future. Serving as Mayor of this great Township has been one of the greatest honors of my life. Every day, I will continue to hold myself – and those who work in Town Hall – accountable for providing the absolute best services we can to our residents. And I look forward to working together with my administration, the staff in Town Hall, the members of Township Council, and our community stakeholders, to build a better, brighter, stronger future for this great Township.